Following the wake of the influential 1862 International Exhibition in London (when Japanese art first reached a wide British audience), this tea service below would have been the height of fashion when it was made by Richard Martin and Ebenezer Hall in 1879. 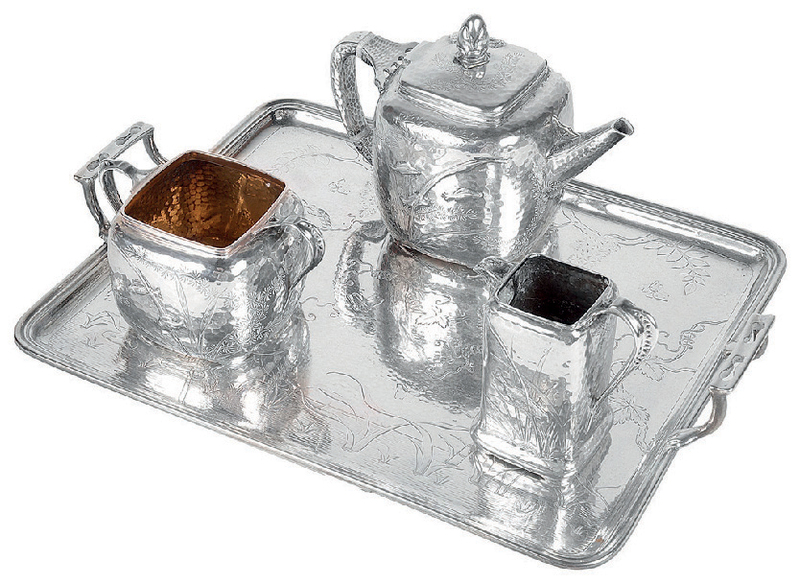 This tea service made by Richard Martin and Ebenezer Hall in 1879.sold for £5000 at Boningtons on November 14. Similar to wares produced by Tiffany in the US, it is decorated to a planished ground with fish among reeds. The back of the tray is engraved with initials and the date July 6, 1880. It sold on thesaleroom.com for £5000 at Epping firm Boningtons (22% buyer’s premium) on November 14.